But is it really a world's first? JVC has announced what it claims to be the world's first consumer camcorder to offer 3D recording in Full HD. 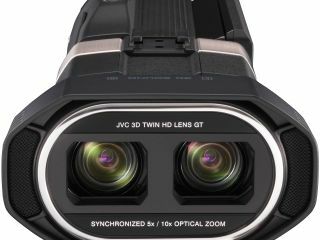 JVC's latest 3D consumer camcorder follows announcements of 3D video cams from Sony and Panasonic at CES 2011. JVC has developed a 'high-speed processor' that can produce two simultaneous Full HD images. The GS-TD1 uses two camera lenses and two 3.32 megapixel CMOS sensors - one in each lens – with which it is able to capture three-dimensional images in full HD "much the same way that human eyes work" according to the company's press release. JVC's new high-speed imaging engine processes the two Full HD images - left and right images at 1920 x 1080i – within a single chip. JCV's new camcorder is also capable of shooting in 2D and a number of other modes, including "Side-by-Side Format" for AVCHD (3D) and conventional AVCHD (2D) shooting. Pricing on all these new 3D consumer camcorders is still to be confirmed, so we will be sure to bring you that information as soon as we have it.